Well, you’re all busy guys running the big deal businesses who love the facts laid out straight as well as bare. So, rather than some wishy-washy intro to this blog post, let me go straight to the point. Here I am going to tell you different kind of Chat SDK tools. So, lack of the Chat App Platform can be a bigger buzzkill! And the main reason for various workplace failures. Today, approx. 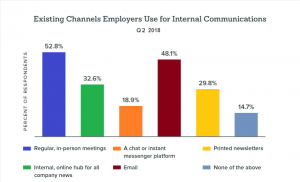 53% of employers are using regular, or in-person meetings! To convey company news, trailed by one-off email messages or email digests (48%). While F2F meetings giving a personal touch! actually, they are not the most adaptable solution for a developing workforce. and emails of companies fill in as cover correspondences without targeting audience segmentation. Chat makes it easy for customers! They can communicate with businesses from home or work! Without the frustration of long hold times. And businesses have the opportunity to provide a pleasant, personalized experience! It keeps their customers happy, without putting a huge burden on resources. Best of both worlds. As Chromeinfotech, a lot of clients are coming to us! And asking for the Best Chat Tools or Corporate Chat Tools. They are always wanted to know which one is the best? According to my knowledge, every tool has its own specialty. Every Chat tools are different and they have excellent features as well. I have chosen the Top 10 Website Chat Tools and in-App Chat Platform that will be beneficial for your product. They are very powerful and can boost your business profit by 40% more. With this, you can manage your team in a more professional way! And no miscommunication gaps will exist. Twilio founded in 2008 by Jeff Lawson, Evan Cooke, and John Wolthuis, and yet it has grown faster. Now, It has more than 400 employees in the San Francisco, New York, Mountain View, Tallinn, London, Dublin, Munich, and Bogota. Fuelling that excellent growth is more than $200 million in the venture funding. From the investors like Redpoint, Bessemer, and Union Square. Twilio have added 1,000 new developers on the platform every single day and hence approx. 700,000 developers have developed something on the top of Twilio. Now, Twilio is the best Chat SDK Tool that is being used by some major brands! For Example, Uber, Dr+ on Demand, Redfin real estate platform, Lululemon, Zendesk, Twitch, and a lot more. Used by – Uber, Redfin, Dr+ on Demand, Lululemon, Twitch, Zendesk etc. Twilio is actually a rocket ship of the vendor. The company provides a group communications apps platform. Which third-party app developers may create into their apps. What the means is that say? Suppose, you’re creating a next Uber app! And you need to allow the customers or suppliers to contact via Chat, voice, SMS, and other means. As opposed to trying to create in the majority of that functionality yourself! You simply “enable” Twilio, and it will take care of it. For an organization like UBER! Doesn’t a means to scale higher load though! But, for geographical spread, the advantages by utilizing a developer tool are tremendous. Programmable Chat has made it simple and easy to actualize chat function. It’s a big value for everyone because it has saved a lot of time to develop a product. 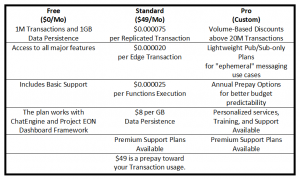 What is the Cost of Twilio? As a ChromeInfotech, we have used Twilio for our client! And it performs well and sat on the client expectations. I do recommend Twilio Chat SDK! If you are looking the best Chat SDK for Android and iOS or Enterprise Chat Software. There are lots of other brands who use Twilio! For Example; Uber, Zendesk, Twitch, eBay, Lyft, Trulia, and more. PubNub was founded in 2010 by Stephen Blum and Todd Greene. More than that, PubNub is usually a secure worldwide Data Stream Network and very easy to use! The API allows the consumers to connect, measure, scale, and manage the real-time apps and IoT devices. With more than 70 SDKs for each platform! 250ms global data transfer time. And the scalability for a huge number of devices. PubNub’s special infrastructure! And, it offers you an ability to connect as well as operate world-class real-time apps and IoT devices. These are some major brands who using PubNub Chat SDK! For Example; Yelp, HubSpot, Logitech, Coca-Cola, McDonald, Yahoo, Zoomy, Wink, FanHub, hike, MashMeTV, Adobe, eBay, One Drop etc. Used by – HubSpot, Logitech, Coca-Cola, McDonald, Yahoo, Zoomy, Wink, FanHub, hike etc. PubNub provides low-latency real-time messaging apps for Android and iOS. PubNub can easily send a message between two devices in the blink of an eye. It was amazing and simple APIs as well as SDKs to build, connect, and scale real-time Team Chat Software on the PubNub DSN or Data Stream Network. PubNub’s Network is the best alternative to build powerful messaging apps for Android phones! Due to the enterprise-grade security, powerful chat APIs, scalability, and reliability. ChatEngine gives a whole framework for Company Chat Software and serverless deployment! Incorporating an SDK, UI components, plugins, and messaging, which is powered by PubNub Network. Now, let’s discuss the price! What is the price of PubNub? As a company, we can say that PubNub is beneficial and best text messaging apps for Android and iOS! It can provide you with a reliable and consistent solution. So, CometChat is actually a robust Chat API & In-App Messaging SDK for Mobile and Web Apps! Founded in 2009. It promptly integrates with more than 92 platforms! And accompanies inbuilt monetization, collaboration, moderation, and administration tools. CometChat also accompanies a Chat UI kit with a completely adaptable source code. Having 50,000+ users! CometChat’s best use cases come from the dating, e-commerce, healthcare, fin-tech, e-gaming, social media, etc. Used by – Afrojack, Bharat Matrimony, Date.com, Harvard University, HDFC Life, JPMorganChase, Rackspace and more. Yet the next preeminent communication apps for Android phones or iOS, CometChat. They offer collaboration chat apps which can run on any platforms. CometChat also provides stunning features and the instant messaging Chat SDK and chat API! And it facilitates Chat, Voice Chat and Video chat features on mobile as well as web apps. You can easily integrate this product on various platforms along with the customization getting it done. CometChat also offers simple deployment of the instant messaging Chat API and Chat SDK on an explicitly expressed cloud server or either on own premises. As ChromeInfotech, we also recommend the client to use CometChat. Due to its excellent functionality and reliability, it is immense chat SDK for your app. CometChat is one of the brilliant messaging apps for android tablets which is used by various brands! For Example, Banyan Tree, Comell University, Bharat Matrimony, Date.com, Harvard University, HDFC Life, and more. Now a question will come to your mind! What is the Price of Pricing Plan of CometChat? 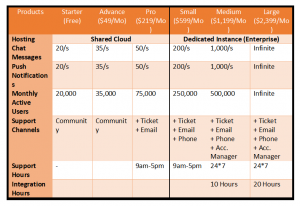 So, the pricing plan is divided into 2 section. Pusher is usually a developer tools organization which is founded in 2011 by Max Williams. It makes collaboration and communication APIs powering applications across the world. Their simple and reliable platform provides everything which the developers may need! It helps to create scalable instant messaging apps for Android phones, iOS and Web apps. Utilizing its core product, developers, Channels can easily build interactive features! For Example, in-app notifications, chat, activity streams, real-time dashboards, or multi-user collaborative applications. Used by – GitHub, MailChimp, Intercom, The New York Times, ABC, Draft Kings. Extensively found as the most prominent supplier or provider of a real-time chat API and messaging SDK along with some excellent and reliable features. Pusher is fully a developer-driven chat feature which helps all the developer to actualize messaging features on the current web and mobile applications. Their ChatKit service is wrapped along with the most of worthy functionalities and codecs build a simple path for developers in order to integrate chat API on iOS apps, Android and Web apps. Chatkit is intended to make it as basic as conceivable to add chat to your application. It gives you a chance to include 1-1 and group chat room to your application, alongside typing pointers, storage and file attachments, user online activity and an adaptable permissions framework. Private and public rooms – Can control the users if they have to access a room. Presence updates – Here you will get updates once users may change their status of online/offline. Files – Users can upload and download the files from the rooms and attach them to the messages. Permission system – Adaptable control on what users will do and access. Typing indicators – Get events once users begin or stop typing in the rooms. Read cursors – You can track of the most read message ID for all member of the room. Most of the clients are asking me which chat app tool is best for their app? 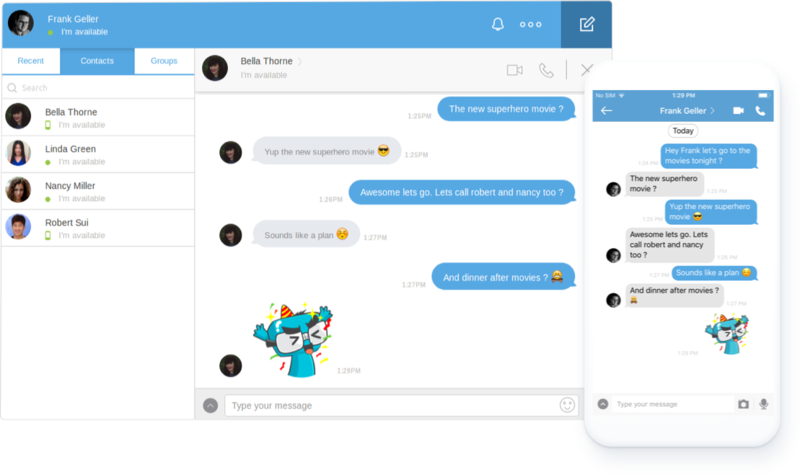 So, I recommend Pusher, it is also one of the best Chat SDK and group messaging app that provides high-quality service as per your need and requirement. Thinking about the Price of Pusher? It is certainly a most scalable and best Chat software for websites and apps which is founded in 2012. SendBird offers chat API and messaging SDK for the in-app messaging on the mobile applications and websites. They having customers from more than 150 nations all over the world! Serving a broad variety of use cases over the communities, on-demand services, marketplaces, games, as well as e-commerce. Used by – ClosingBell, Noonswoon, KFIT, Funster, Survey, Throwing Fruit, Veaver Enterprise, Hyrecar. Considered as the leading and main providers of the messaging SDK and the chat API for Android and iOS apps to the worldwide clients. 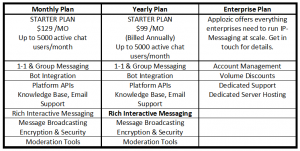 In-app messaging, as well as integration, are one of their critical elements while comparing to the other chat app SDK and the messaging API suppliers/providers. Their messaging API and chat SDK allows the direct messages, open as well as group channels! And it comes with an advanced feature which creates consistent communication with all the users. For the gigantic crowds, SendBird can have more than 100,000 simultaneous watchers for each live video stream. SendBird additionally integrates effectively with bots to help with the customer support and item proposals. With the implementation of advanced technology, allows retaining of monstrous scalability of users that help an extensive variety of uses cases over the On-demand services, Communities, and Gaming. Peoples always asking me to suggest the best business chat software that will suit all their perquisites and necessities, in this case, I strongly recommend them SendBird Chat Tool. As ChromeInfotech, we have used this tool for clients and we have seen amazing effects after utilizing this tool. You can easily integrate chat SDK with your app (either Android and iOS) and start functioning in the precise and friendly manner. Now, a question will come to your mind! What is the Price of SendBird? More than that, Sendbird is very impressive and reliable Chat SDK platform for Android and iOS.This can provide you with amazing functionality and features. Also, it offers you three-months trail. So that you can decide you need this or not. I have also tasted SendBird and I can say this is one of the best choices. If you opting this tool for your app. Founded in 2009! QuickBlox is really a cloud communication backend platform which allows adding Chat! Push Notifications, Video calling, Cloud Sync into the mobile and web applications. So, it is a drag and drops Skype. QuickBlox is utilized by lots of social networking applications! And a wide range of enterprises! Including Google, Apple, Microsoft, BlackBerry, Unilever, Barclays, Singapore Telecom etc. Used by – Apple, Google, Microsoft, HeyTutor, uCarenet, mmoc, Speechyard, Social Career, Unilever, BlackBerry, Barclays, ManCity etc. One of the primary patrons of backend foundation of the chat application! Chat API, Chat SDK for iPhone and Android platform. Quickblox is usually a developer toolkit! And it enables all the developer to create Text, Audio and Video enabled source code which supports every platform. With their wide range of services in offering chat API and SDK for Android/iOS! Obtained an appealing client base and build an enormous number of chat applications. After this, you might be thinking! What is the Price of Quickblox? I recommend this one as well if you are in need to have the best Chat SDK Platform! This is actually one of the best Chat SDK Software which can be easily integrated with your app and performs well. Try it and you will be happy for sure. Applozic is founded in 2015 in California, United States. It is really a Cloud-Based Messaging Software and as a Service! Which can be utilized to embed the Messaging, Chat, & Audio/Video Calling in all the applications. Applozic is usually a boutique Messaging platform! And it can be used to install any kind of communication in all the application. A straightforward similarity is with platform undertakings! It can construct their own ‘Android chat application like WhatsApp in the white label’. To integrate into their applications or sites. Applozic is essentially a complete chat solution for business! And all the correspondence needs! And it has provisions for the front-end UI customizations! It comes with an open source UI kits, SDKs and APIs! This is for the development, integration and backend server as well. Applozic is being used by lots of applications and websites! Including Xchanging, DXC technology, Air Astana, IEEE, CarTrade, Godrej, etc. Used by – 8apps, Amikumu, Magicbricks, DesignSense, Explara, LAM, Yogatrail, Zimmber. A glorious messaging tool controlling the conversational interface to next level. They provide a first-rate and best chat platform for business. With some inventive features which result in awesome functionality. Applozic helps integration on various platforms! And lots of rich features running from 1 to 1 video or voice chat. To your in-app messaging. Their Chat Messaging API for Android/iOS is principally designed for some big brands with exhaustive customization. The Chat Messaging SDK for iOS/Android allows hosting on the database servers! And empowered with the message broadcasting function. Now let me tell you the pricing model of Applozic! Because this is one of the most important element to consider. What is the Price of Applozic? Another review by Pratap G.
The advantage is creating one’s very own Communication Channels! And the integration turns into a breeze! With the Applozic and should be possible in just 30 minutes. In this manner sparing Development as well as Infrastructure costs. This tool is one of the most recommended best business messaging app! That provides you with a very helpful solution for your app. Founded in 2017! Mesibo is essentially a cloud communication platform! Which makes it amazingly simple and easy! To include real-time chat, video, voice features to the mobile applications, and websites, in the very meantime. Mesibo supports the complexities of the messaging not just by providing the cross-platform API, and ready to use UI. Moreover, a strong, adaptable carrier-grade platform that starting from the earliest stage! To support lots of simultaneous calls and messaging along with low latency as well as high dependability. Additionally, it builds chatbots for customer support or conversational commerce. Mesibo is the one simplest and complex business messaging app and utilized by few major industries. For Example; Alcatel-Lucent, Stanford, Aricent, Infosys, Texas Instruments, IBM, and Viacom. Used by – Stanford, Alcatel-Lucent, Aricent, IBM, Infosys, Texas Instruments, and Viacom. Mesibo is a best and real-time chat API and SDK and communication tool provider. And, It is empowered with chat, voice and video features for major industrial sectors? The chat SDK product provides both free as well as the premium source code! And, it comes with the customization edge! To allow a bunch of high-end functions with an excellent user experience. As per my recommendation, you can also go along with this tool as well. This is the strong Chat SDK that will provide you the best and reliable support in real-time. What is the Expected Price of Mesibo? Agora.io allows developers to include HD broadcast, voice calls, and video calls into mobile or web applications through SDK. Established in 2014! Agora is a high-development Communications-Platform-as-a-Service (CPaaS) supplier! And, it is conveying mobile first! And the real-time Chat SDK for developers and businesses comprehensively. Agora’s API is usually embraced API for real-time communications across the globe! This is installed on 500+ million devices and still growing. The Agora real-time correspondence stack incorporates functions! For Example; incorporate voice and video calling, interactive broadcasting, group conferencing, and significantly more. Dependable, open and scalable, Agoria.io gives correspondences services! To the companies over ventures! For Example; telemedicine, financial services, and mobile gaming. Used By – meetme, CAMBLY, talk space, hike MESSENGER, everbridge, momo etc. Agora offers the best Chat SDK for Android/iOS and the messaging API! It helps to multiple platforms! Moreover, it encourages in supporting group voice conferencing! Along with more than 10,000 users. Their chat SDK and API helps to integrate call functions on mobile apps such as Android, iOS, and windows. Agora has an amazing audio calling quality element! That retains a huge scalability in an easy way. And furthermore offers consistent integration of the video and audio for the gaming apps. Now, come to the pricing plan of Agora! What is the Price of Agora? if you want to integrate video or audio chat SDK into your mobile app! This is the right tool for you. I strongly recommend this tool! To enable audio and video chat in your app. Established in 2008 by Sriram Manoharan. Contus Fly is a texting application developer that gives companies a chance to make real-time chat SDK for Business! It will help to improve their communication, cooperation, and commitment. They have been conveying creative SMAC arrangements! Through the product and services to the customers in 40+ nations since 2008. They are operating from India (Chennai) and USA (Sunnyvale). It enables the customers to work with them at ease. The apps for these tools are vast – personal chat, enterprise chat, social chat, in-app chat, and so on. Chat apps developed with Contus Fly are extremely adaptable! And will be tailored in order to suit different business needs and requirements. Also, Contus Fly messaging apps will oblige modifications and alterations on the fly! And can undoubtedly scale and add new technologies as well as integrations with no trouble. Either it is a voice messaging, video calling, push notifications, and some other communication channels, Contus Fly may build communication apps which fit accurate user particulars and purpose. It is an extremely popular Chat SDK tool which is used by some big names! For Example, DAIMLER, Mahindra Rise, BHARATBENZ, JCB, Accenture, The World Bank, Dr. Reddy’s, KANSAI NEROLAC, FATHOM, Versa Networks, Hyundai, Infosys, Learning Space etc. Used By – DAIMLER, Mahindra Rise, BHARATBENZ, JCB, Accenture, The World Bank, Versa Networks, Hyundai, Infosys, Learning Space etc. Contus Fly provide you a platform that empowers you to create real-time messaging applications! And, this can be customized to accommodate your current needs! Yet adequately flexible to scale when your necessities change. You can create and deploy applications voice messaging, video calling, and chat for an assortment of direction and requirements. You and your developers are granted for the complete access to the source codes of your applications. That means you have complete control on all over your apps and it features or functionalities among others. That also means you may shape as well as re-shape the messaging applications! Based upon your present requirements! And after that change them again as your business necessities and policies change. With Contus Fly, your team may communicate anywhere and anytime! The way which suits your needs. Collaboration turns into a breeze too and the delegation is a walk into the park. Either you are working with an in-house team or collaborating with experts dispersed over the world! Contus Fly gives you the platform to make instant, clear and profitable messaging. Now, you might be thinking! The pricing information of Contus Fly is available only upon request. You can connect with the company for more details. Here, I have described Top 10 Chat SDK Platforms. Which is very useful to engage the users and boost the conversion by 40%. I hope this post will help you find out the best Chat SDK tools for your brilliant app. If I have missed any of the Chat SDK tools which you are looking for! Then you can provide your suggestions in the comment sections. I will definitely include those tools later in this post. Moreover, if you have decided to choose the best Chat SDK product! And you are still not clear which is the best for your app? You can contact us at Chromeinfotech. We are a reputed Android and iPhone App Development Company! And we provide an outstanding service for your million dollar app. Our trained experts will give you the best quality service in the given timeframe. So, choose the best Chat API and SDK Platform as per your need! And move your business to the next level.